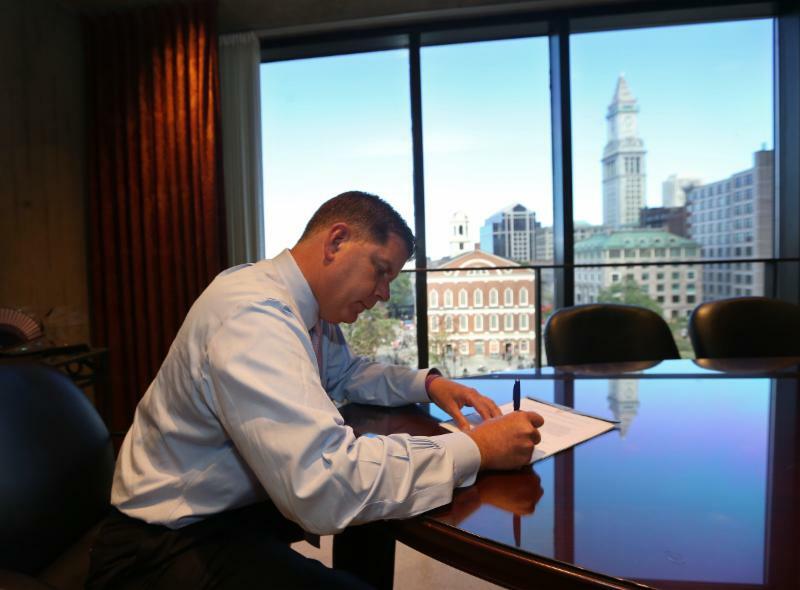 BOSTON - Friday, June 15, 2018 - Mayor Martin J. Walsh today signed a citywide ordinance establishing guidelines and regulations to better track and regulate short-term rentals in the City of Boston. This ordinance will go into effect on January 1, 2019 with a provision allowing current lease holders operating short term rentals the opportunity to continue operating until September 1, 2019. The proposal was originally filed by the Mayor in January, resubmitted by the Mayor in May, with further amendments contributed in collaboration with the Boston City Council and conversations with residents, advocates, and public and private stakeholders, all following two years of careful study and consideration by the Walsh Administration. The ordinance being signed today reflects the shared goal of providing economic opportunities for residents and temporary accommodations for visitors, while preserving Boston's housing stock. "My goal in regulating short-term rentals has always been to responsibly incorporate the growth of the home-share industry into our work to create affordable housing for all by striking a fair balance between preserving housing while still allowing Bostonians to benefit from this new industry," said Mayor Walsh. "I am proud to sign this ordinance today and I am committed to monitoring the impacts to ensure it serves its intended purpose in our neighborhoods." The regulations allow for the growth of Boston's home-sharing industry, while including deterrents to prevent operators from monopolizing Boston's housing market with short-term rentals. In addition, the regulations provide a standardized framework for regulating these units that meets the needs of the evolving industry provides protections for occupants, and minimizes the impact on surrounding neighbors of these units. These regulations only apply to property owners registered with the City to operate a short term rental in their unit. Non-owner occupants are not permitted to operate short term rentals in their leased units. Limited Share Unit: consists of a private bedroom or shared space in the owner-operator's primary residence, in which the operator is present during the rental. The fee associated with this classification is $25 per year. Home Share Unit: consists of a whole unit available for a short-term rental at the primary residence of the owner-operator (unit in which operator resides for at least nine months out of a 12 month period). The fee associated with this classification is $200 per year. Owner-Adjacent Unit: consists of an owner-occupied two- or three-family building, in which the owner lists a single secondary unit as a short-term rental. The fee associated with this classification is $200 per year. The regulations also provide protections for the occupants of the short-term rental unit by prohibiting any property with outstanding housing, sanitary, building, fire or zoning-code violations from being listed. In addition, the operator is required to provide notice to abutters of a short-term rental unit within 30 days of approved registration. The regulations require the unit to register with the City of Boston each year to verify compliance with the provisions of the ordinance, and pay an annual license fee. Penalties will be incurred to any person who offers an ineligible unit as a short-term rental, fails to register, or fails to comply with a notice of violation. To assist with the enforcement of regulations, booking platforms will be required to provide the City with monthly data and information relative to the short-term rental listings that detail the location and occupancy numbers. In January, the City released a Request for Information (RFI) to identify software solutions that will enable operators to register and renew short-term rental units online, and facilitate the enforcement of the conditions of allowable short-term rental use. Today's announcement builds on Mayor Walsh's commitment to addressing the housing demands in Boston. To date, the Walsh Administration has committed more than $100 million in funding to the creation and preservation of affordable housing. Today's announcement builds on the City's preservation and anti-displacement goals, outlined in Housing a Changing City: Boston 2030, Mayor Walsh's housing plan, and the housing goals laid out in Imagine Boston 2030, Boston's first citywide plan in 50 years. As part of both plans, Boston has prioritized increasing the overall housing supply, with a focus on creating and preserving affordable housing. In addition, a new source of funding for affordable housing, historic preservation, open space and public recreation was established through passage of the Community Preservation Act in November 2016. Since the launch of the housing plan, 24,454 new units have been permitted. When complete, these developments will be enough to house 48,600 new residents, and begin to relieve pressure on rents in existing housing. Of these, 4,649 new income-restricted units have been permitted, of which 2,234 are targeted to low income households. There are an additional 4,240 deed-restricted units in the City's development pipeline. Data shows that the availability of short-term rental units has a direct correlation to housing costs. A 2016 study by UMass Boston found a 0.4% increase in rent prices due to increases in AirBNB listings, and a nationwide UCLA student also found a 0.42% increase. In addition to rent increases, the commercialization of short-term rentals in residential dwellings and residential neighborhoods has the potential to reduce availability of long-term housing for owners and tenants alike, and is contrary to the Administration's goal of adding 53,000 units of housing across a variety of income levels by 2030. In addition to creating new housing, the Walsh Administration is focused on protecting the tenancies of Boston's residents, launching the nation's first Office of Housing Stability in 2016. In addition, Mayor Walsh has strengthened tenants' access to information by creating the city's first online guide to the eviction process.